Various Delaware County high school students pose together after being recognized at the annual Delaware County Career Portfolio Recognition Breakfast at First Commonwealth Bank. Pictured, left to right, are Nick Koren, Sarah Marsh, Jackson Schiefelbein, Natalie Amodeo, Rakiatu Bangura, Carolyn Moorman, Sarah Lehner and Rebecca Fitch. 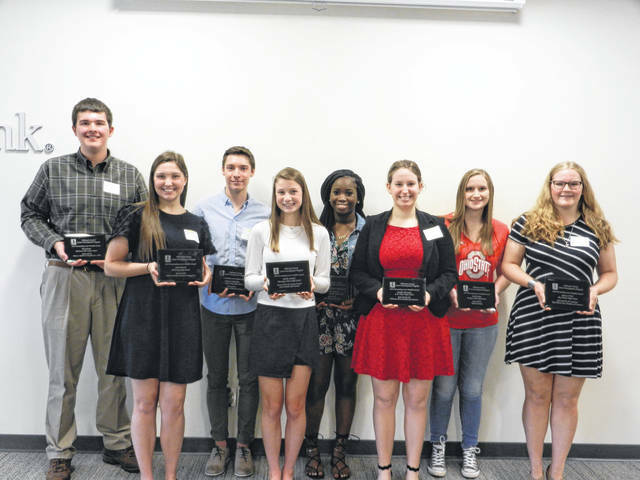 On April 26, eight area students were honored at the annual Delaware County Career Portfolio Recognition Breakfast at First Commonwealth Bank. Each student received a $250 cash award from their sponsoring organization and a plaque from the Delaware County Career Development Program. The Career Portfolio is an individualized exit credential prepared by all the graduates of Big Walnut, Buckeye Valley, Delaware Area Career Center, Delaware Hayes, Olentangy Liberty, Olentangy Orange, Olentangy and Thomas Worthington high schools. One student from each school is chosen to be recognized by a panel of over 20 judges. These volunteer judges consist of community members, area businesses, Rotarians and educators. The Career Portfolio is intended as a summary of a student’s achievements in high school and a blueprint for the immediate future. Students are encouraged to use their Career Portfolio in employment, college admissions, and scholarship interviews to help the interviewer get a more complete picture of the student’s background.